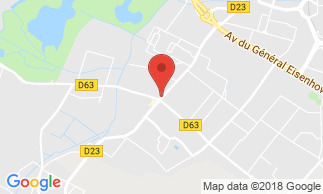 Conveniently located just 10 minutes from Toulouse Blagnac airport, 15 minutes from the city centre of Toulouse, near the "Golf de la Ramée", the Residence de Diane**** combines luxury and character in a landscaped park of more than 1 hectare. The residence offers 53 fully furnished apartments with sober and modern design. You will enjoy the outdoor pool, the tennis court, the bar, the free car park, the laundry service and ironing equipment on loan at the reception. For your dinner, you can also order your meal at the reception. A detailed menu is available and directly served in your room. During your overnight stay or long stay, you will appreciate the tranquility and authenticity of this 4 star aparthotel. You can order your meal tray at the reception of the Residence de Diane; it will be delivered directly to your room. You can choose from a selection of appetizers, main dishes, desserts and drinks. You can also dine in one of our partner restaurants. (More information at the reception). The Residence de Diane offers 53 stylish and spacious (30 - 60 m²) apartments for up to 6 persons. These air-conditioned apartments have been designed to guarantee you the best comfort, in a sober and modern design. They are fully furnished and equipped with the following amenities: bathroom with bathtub, hairdryer and towel dryers, toiletries, separate wc, triple glazing, air conditioning, safe, free WiFi Internet access, LCD TV, Canal+ and Canal SAT+ channels, BeIN Sports, kitchenette, kettle, microwave oven, hob and extractor hood, dishes, refrigerator, dishwasher,desk, table and 4 chairs. Ground-floor apartments with terrace, in a higher floor or duplex; each apartment exudes a neat and clean ambience, offering high quality services for a peaceful and relaxing stay. - Apartment for 4 persons: for up to 5 persons, 45 m², 1 bedroom with queen-size bed (160 cm), 1 convertible sofa bed in the living room and 1 fold-out bed. Baby cot available free of charge. On request. The Residence de Diane is located in Toulouse, in the French department 'Haute Garonne', in the Midi-Pyrenees region. The residence is located 15 minutes from the city centre of Toulouse, in the south-western part of the city, close to the 'Golf de la Ramée'. The breakfast is served every morning in the breakfast room from 6.00 a.m. to 9.30 a.m. on weekdays, and until 10.30 a.m. on week-ends and bank holidays. Buffet breakfast: mini-pastries, fresh bread, cereals, jams, honey, butter, dairy products, cheese, fruit juice, hot chocolate, coffee and teas. Breakfast is not included: 14 EUR per person. Check-in : 4 pm / Check-out : 11 a.m.